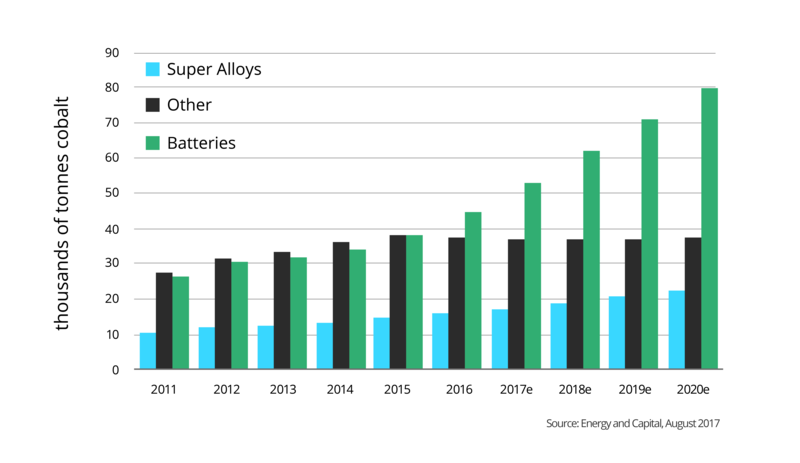 Cobalt has become one of the most in-demand minerals today due to its vital role in rechargeable batteries used in electronics and especially the surging electric vehicle market. But the world's supply of cobalt is threatened on multiple fronts. With 98% of cobalt production coming as a by-product of the cyclical nickel and copper mining sector, and with roughly 60% of cobalt sourced in the conflict-ridden Democratic Republic of Congo (DRC), the need is high for primary cobalt production that is secure and domestic. 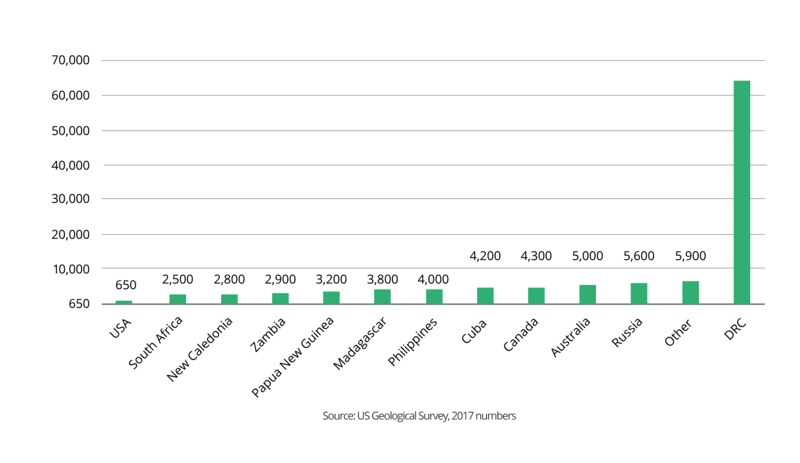 The US Geological Survey (USGS) estimates global cobalt production in 2017 was 110,000 tons. 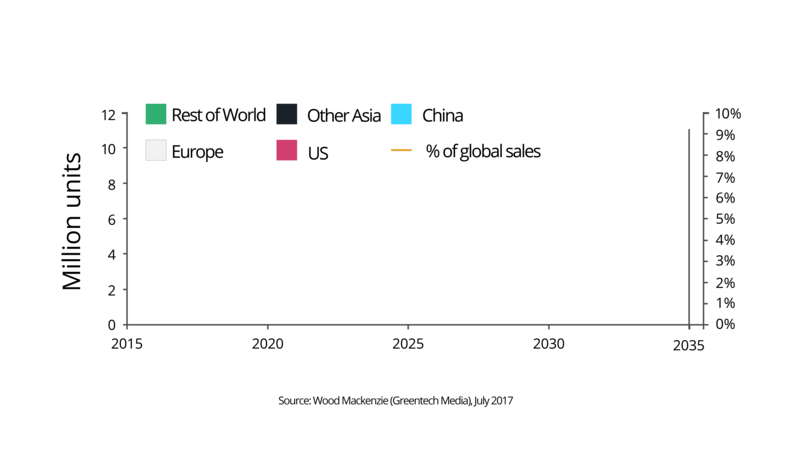 Driving this rapid growth in demand are companies dependent on rechargeable batteries, from consumer electronics giants such as Apple and Samsung, to nearly all the large automakers aggressively expanding their electric vehicle (EV) lines, from Tesla to Toyota, Ford, General Motors, BMW, VW Group and China's leading EV company, BYD. 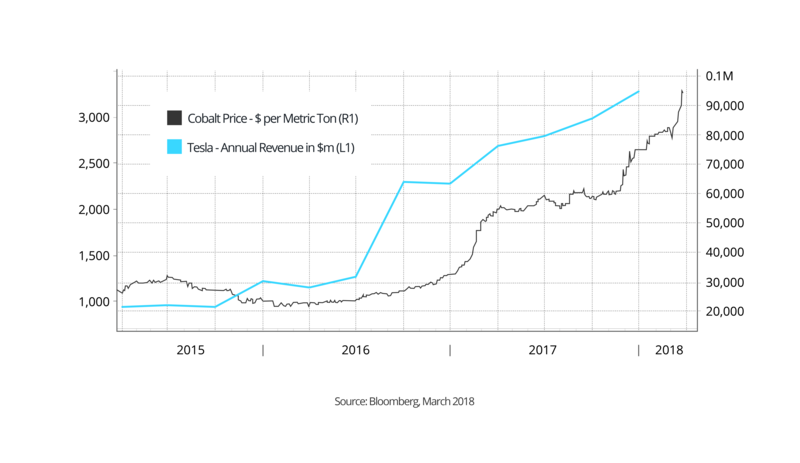 At the same time, Tesla's CEO, Elon Musk, has committed to sourcing only North American cobalt for his electric cars, representing ~7,000 tonnes of cobalt each year for his massive Gigafactory battery plant. Of the 5 most common types of rechargeable batteries, 3 rely on cobalt for their compositions. NMC and NCA batteries are the 2 leading technologies favored for EVs, due to their exceptional energy density. 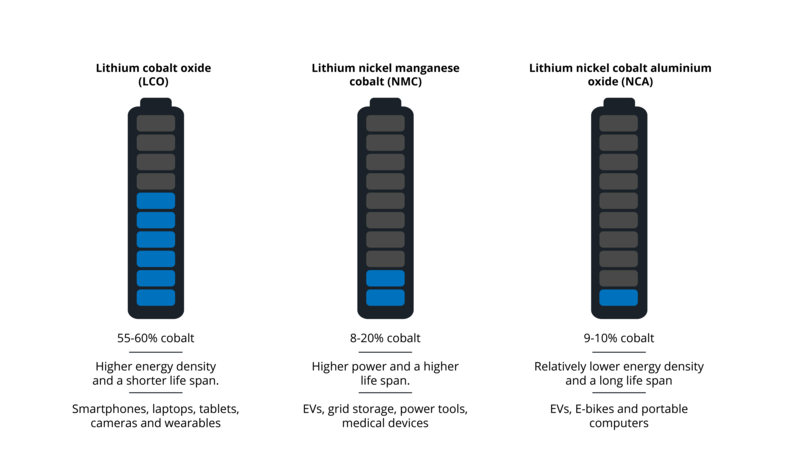 Cobalt makes up 8 to 20% of the longer-life, more stable NMC battery, which is the most prevalent battery type used across plug-in hybrid electric vehicle (PHEV) and EV models. The higher-energy density NCA battery used by Tesla for its Model S, is made up of 9 to 10% cobalt. The LCO battery favored for electronics, meanwhile, is made up of 55 to 60% cobalt. With global demand for cobalt increasing rapidly, reliable production sources are crucial. However, most cobalt is produced as a by-product of nickel and copper mining operations. With nickel and copper prices commonly suffering from price swings, the predictability of developing or maintaining such mining operations can be less than desirable, and can adversely affect cobalt prices. Even more significant is that roughly 60% of the global cobalt supply originates in Africa's Democratic Republic of Congo (DRC), which has been crippled since the 1960s by political uprisings, wars, violence and corruption. In recent years, the violent political scene has closed borders, affecting the export of vital cobalt supplies. Meanwhile, some of the world's largest corporations that use cobalt are being pressured by human rights organizations to ban imports from the DRC due to the cobalt supplies commonly being linked to child labor and unethical mining practices. Due to cobalt supply risk, companies are looking for long-term supply deals, including BMW seeking a 10-year deal for its electric car program, and Apple reportedly in talks to secure several thousand metric tons of cobalt a year direct from miners in a deal spanning 5 years or more. On the national front, the US Geological Survey (USGS) in late 2017 listed cobalt as a critical mineral resource for the US. The following day, a Presidential Executive Order was issued on a federal strategy to ensure secure and reliable supplies of critical minerals "that are vital to the Nation’s security and economic prosperity". "streamlining leasing and permitting processes to expedite exploration, production, processing, reprocessing, recycling, and domestic refining of critical minerals". 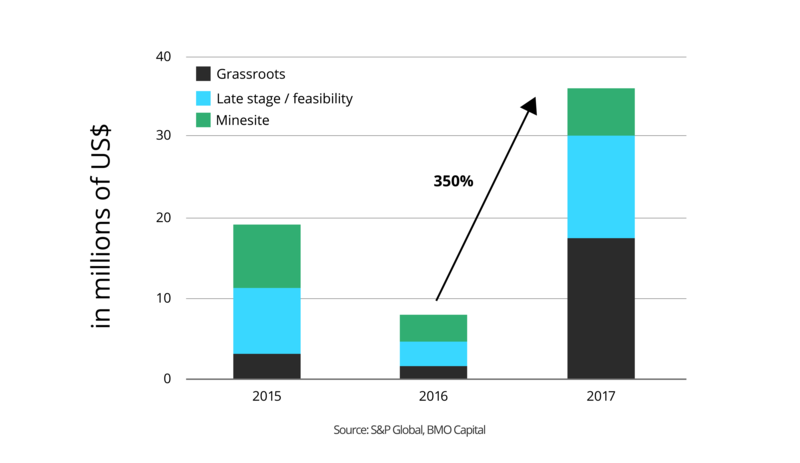 With growing market demand and the need for cobalt production that is secure and domestic, progressive companies are acquiring, exploring and developing US-based cobalt properties. Among those opportunities, the USGS singles out Idaho – where Century Cobalt's project is located – as representing 1 of only 2 deposit locations in the US where primary cobalt production could occur (i.e., production not as a byproduct of another metal). Learn more about the Idaho Cobalt Belt .